Invites us to tailor make our habits to find balance between our well-being and our daily routines. This New Moon occurs at 17 degrees of Virgo opposing Neptune at 15 degrees of Pisces that is close to Earth (retrograde) to ask ourselves: What part needs some alterations to perform better! What part of our lives needs some adjustments? Where we have been having some excesses? For some maybe it relates with the amount of time spent working in a chair… and our back is having some pain… So we need to walk more and stop working extra time… Or it could be the other way around, you don’t have any formal work and you need to find it. 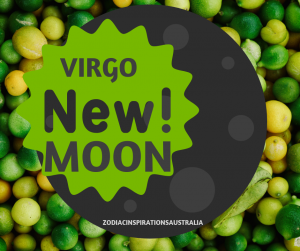 Under the Virgo New Moon we have an excellent opportunity to plant intentions to improve a skill, improve our health including our mind, body and inner world! Lastly, balance our lives creating healthy habits and daily routines. It is like when we have fresh water with lime and mint when you are thirsty!!! The body feels nurtured, know what I mean? Well we not only need to refresh our lives with fresh water but also we need to feed our lives with positive thoughts and our inner world. Jupiter and Pluto smile at the New Moon allowing us to transform our routines with a positive attitude. And Mercury – the planet ruler of the New Moon – is supported by Uranus and Saturn. Awesome energies to create healthy habits that help us to improve our daily work and ability to adapt to things we cannot change. But remember “Everyone thinks of changing the world, but no one thinks of changing himself.” ― Leo Tolstoy – Sun & Moon in Virgo. What it is very helpful and I am making it a habit, is writing in the morning my “to-do lists” which help me to give myself a sense of order and efficiency with less stress. Are you looking for a job?? Do you want to lose some weight ? Or manage stress better? This energy is great to plant your new daily routine to achieve these goals!!! But avoid overthinking or overanalysing situations and thoughts… and instead do it! Don’t forget to write a plan next to your affirmations and work on your goals every day to see them blossom!! !